Alberobello Italy is one of the many quaint little towns that can be found throughout Italy and is in the Apulia region of Italy. Alberobello which was founded in the latter half of the 16th century couldn't be more in the middle of the region as it is almost dead center from north to south as well as east to west. The one thing that makes Alberobello stand out from other towns in Italy is it is called the Trulli capital of Italy, it gets this name because most of all Trulli style houses can be found in the town and in the surrounding valley. 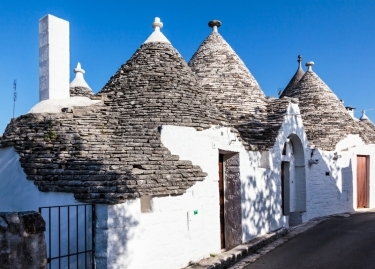 Trulli is a fascinating style of architecture where the roof is built using stone blocks and is shaped like an upside down funnel or commonly called a conical shape. What makes the roofs truly amazing is the fact that when these houses were built they didn't use any mortar to hold the stone roof blocks together. From what I read the reason behind this was a much higher tax on the homes if mortar was used on the roofs as opposed to not using mortar. Of course this way of taxing a house doesn't exist now so over the years owners of this type of house have added mortar to the blocks on their roofs. Most of the Trulli style houses are still lived in but some have been grouped together and turned into hotels, little souvenir shops as well as some restaurants. Because this area is the only area in Italy that has this style of house and because of the age of most of these homes the area also carries the status of being a World Heritage Site. Getting to Alberobello will take a little time depending on where you are coming from, If you are staying in Bari the capital city of Apulia you can go by train, bus or car and is only a little over 50 miles. If you are coming from one of the major cities like Rome you could drive since there are several routes you could take and would be pretty direct or go by train which in this case you would have to go into Bari and transfer to a regional train to Alberobello. I don't know of any buses going from Rome to Alberobello so the only other way to get there could be to fly from Rome to Bari then either drive or take the train or bus. In any cast from Rome it would take you in the range of six hours if you go by train, by car will depend on which route you take and how many times you stop and sightsee along the way. Once you get to town you will probably spend most of your time walking around the winding narrow streets enjoying the sights, shopping, eating and tasting the local wines. The oldest areas of town having Trulli houses are divided into 2 districts one is the Monti district which is where the trulli zone is and is a bit touristy and the Aja Piccola district which is not as touristy. Both areas have slightly different Trulli houses as most in the Monti district have the main part of the house white washed where the Aja Piccola district most are left natural and un painted. While you are wondering around you might as well check out Trullo Sovrano which is the largest Trulli home in Alberobello and has 12 cone roof's on it. Depending on what time of year you are there the town has quite a lot of activities going on as in the summer they have a national folk music festival in July, as well as a jazz festival in the summer as well there are also some theater and dance events. As soon as I can find some exact dates for these I will post them. Other things to do would be to visit the Trulli museum, it isn't huge but has interesting information on the construction of the trulli house. The Museo del Territorio which is the town's main museum and see the trullo church of St Anthony. If you are interested in staying a night or two in Alberobello I have a list below of the hotels in town and just on the outskirts of town to save you some time in looking. Keep in mind that the price you see when you click any of these links bellow are low season and will change as soon as you put in the dates you want to stay and If you want to see all the hotels in the Alberbello area just click on the banner to the left or click here.